Deer go wild for the sweet aromas and delicious taste of ripe juicy apples and now Wildgame Innovations is bringing the orchard to you in an easy to use and powerful deer attractant we call APPLE CRUSH! Hunters everywhere have experienced the renowned power of apples to draw deer in for decades. However, apples are difficult to find in the wild and most hunters don’t have fresh apples readily available for their hunting location. We’ve heard time and time again about the demand for a highly attractive supplement with REAL fresh apples and now have answered that calling. 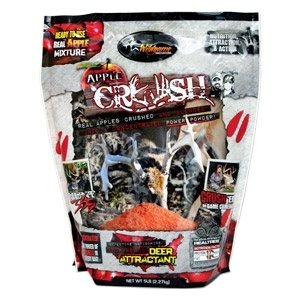 We take fresh all-natural ripe apples and slice ‘em, dry ‘em and CRUSH ‘em with an irresistible sweet mix of proteins and fats into the ultimate deer attractant. Whitetail will come from all over to seek out this tasty and nutritious treat that will bring out even the most cautious of bucks. Use this real apple power-powder on your next hunting trip and CRUSH that trophy buck you’ve been waiting for!